Our human imprint and the memory of our movement linger in spaces well after we have migrated through them. The One-Mile Radius Project explores these imprints and the unique spaces within a one-mile radius of Joe’s Movement Emporium. 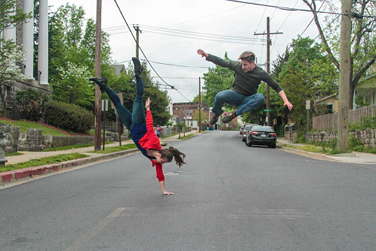 In collaboration with Joe’s, the Maryland-National Capital Park and Planning Commission, Brentwood Arts Exchange and their workshop participants, Orange Grove Dance will investigate the personal and uniquely traversed spaces of the community. Dance, film and projection will be used to zoom into and magnify the intimate nooks and crevices of seemingly familiar spaces and, in turn, bring those outside spaces inside the walls of Joe’s. Founded in 2007 by Colette Krogol and Matthew Reeves, Orange Grove Dance is built on the ideals of integrating dance, art, film and movement with all communities, large and small. Pay what you wish, registration recommended.